RazorSQL is a software developed by Richardson Software which can help the user in query building and browse easily between data. Among its many features are SQL editor, import/export data and data compare. 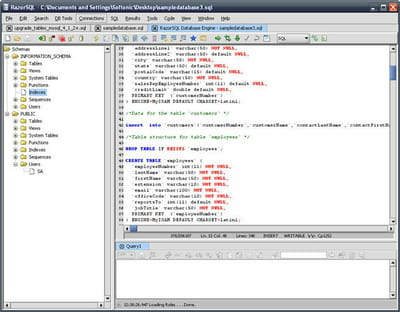 Browsing: The program offers the possibility to browse through database structures. It allows the user to see all the information concerning the object. He can also create SQL statements for tables from the menu options. 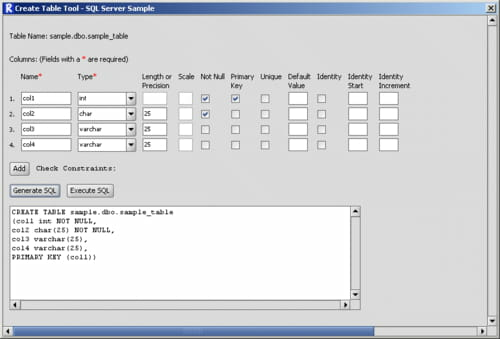 Building: RazorSQL also enables the user to create, insert, update or delete SQL statement against the tables. He just has to select the related tab and it will generate its corresponding. Statement can also be joined with tables by clicking the add table button. Importing: This utilitarian permits to import data from various sources like Excel spreadsheet or SQL statement in the tables. Many options are available like the halt on error if it occurs during the transfer and the delimiter used to separate values in the file. The software has a clear interface which makes it easy to handle. This is a shareware version of RazorSQL. Latest update on June 22, 2015 at 10:43 AM.